Designed to use the sun's FREE heat to shower before and after jumping into your pool. 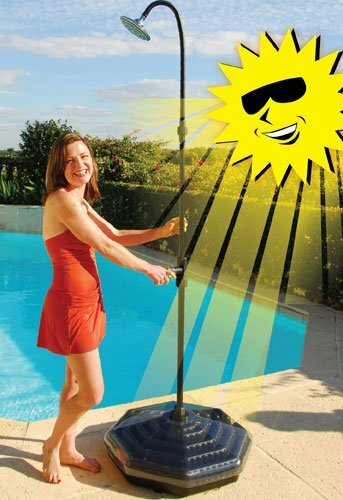 Using this unique solar shower will help you save on energy costs. The sun heats up the stored water in the base similar to how a garden greenhouse works. Base stores up to 5 gallons of water. The heated water is mixed with the water from your garden hose to give you a comfortably warm shower. Shower stands approximately 7 ft tall. If you have any questions about this product by Doheny's, contact us by completing and submitting the form below. If you are looking for a specif part number, please include it with your message.